Hand-picked Wild Hibiscus Flowers in syrup - 11 flowers. Place a flower in a glass of sparkling wine and turn your drink a beautiful pink colour - you will never drink sparkling wine the same again! Simply place a whole Wild Hibiscus Flower in the bottom of a Champagne flute, pour in some syrup and fill up with bubbly! When you have finished you can eat the flower which has a delicious raspberry and rhubarb flavour and acts as an antioxident and cholesterol buster too! Hibiscus Flowers are well known for their medicinal properties. Hibiscus tea is a popular afternoon drink around the world and is thought to aid reducing inflammation, blood pressure and cholesterol. Storage after opening please refrigerate. Completely free of all artificial ingredients. Rosella flowers (lat.Hibiscus Sabdariffa) are grown around the world, from Sudan to South America to Australia. But the best is grown amid the pure green rainforests of Malaysia, where we grow our flowers. We are taking a flower that has been used for thousands of years – it was the preferred drink of pharaohs – and harnessing it to new technology and best-practice farming to produce a unique range of products that both taste good and are have a wide range of health benefits. We hand pick and personally inspect each and every flower. The flowers are then carefully selected, cored and conserved with a syrup made of just water and cane sugar. No pesticides or artificial flavours, colours, preservatives or any other additives are used, making them 100% natural. 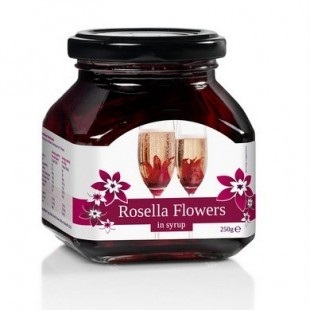 Rosella Flowers are edible and work great with sparkling wine, but there’s more: how about giving a twist to your cocktail menu, your alcohol-free drinks or even on your dessert? Your customers will love it! 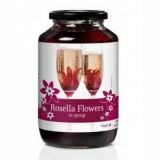 Sugar, Water, Roselle Flowers (Hibiscus Sabdariffa) (22%). Store in a cool, dry place. After opening, store chilled. Place a whole Rosella Flower in the bottom of a champagne flute, and fill with champagne or sparkling beverage.